We are extremely lucky to have the privilege to teach amazing kiddies such important life skills in a natural, breathtaking environment. Not many other swim school have the ocean right on their doorstep, being such a special swim school our students need to ensure they have certain items. No matter what level of learn to swim or squad your child is in there are a few things that they will always need and why they need them. Swimming Cap (silicone not fabric or rubber) : You lose a lot of body heat through your head so having a swimming cap on is like wearing a beanie, it will keep them much warmer as well keeping hair out of their face. Goggles: Every little swimmer needs goggles and needs to start taking them to lessons. 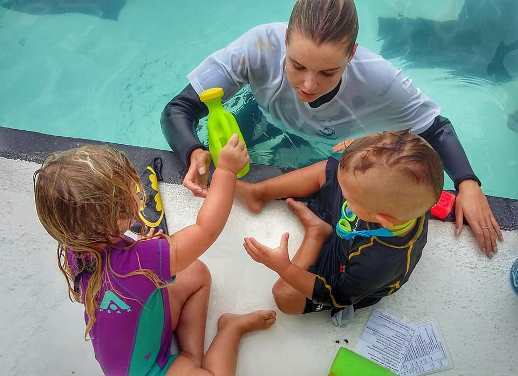 It is very common for your little one to not want anything to do with goggles (we all know how hard it can be to keep anything on a toddlers head) but as soon as they become comfortable with putting their face and eyes in the water the sooner they will become swim safe. A really helpful tip is to get them to try their goggles in the bath, somewhere they are warm and comfortable. Wetsuit: Not only will the wetsuit help keep your little one warm but it is also great sun and wind protection. We are learning to swim out in the elements! If you need any more information or advice on what goggles, cap or wetsuit you should be getting, please give us a call. All items are also available online at our shop and we have them waiting for you down at the pool! If you are yet to enroll into Term 3 of the swimming term, it is not too late – there are 10 more weeks to go! Prorated enrolments are available, if you have missed the first week of term. Please get in contact with us as soon as possible to organise lessons, as spots are filling up fast. The prorated enrollment apply for parent and babies & toddlers, learn to swim and squads. We also can apply prorated prices is you decide to book your child into a second time slot. It can be extremely beneficial to have your little one swimming twice a week as it fast tracks their swim progress and build their confidence in the water!